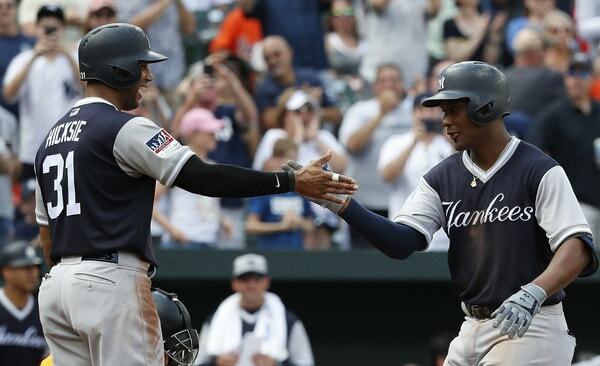 According to George King, the Yankees placed Miguel Andujar, Greg Bird, and Aaron Hicks on revocable trade waivers last Thursday. This is the first bit of Yankees’ trade waiver news reported this month. I’m certain several other Yankees have passed through waivers already. We just don’t know about it. All 40-man roster players must go through trade waivers to be traded after July 31st. Non-40-man players can be traded at any time. They don’t require waivers. Players claimed on trade waivers can only be traded to the claiming team within 48 hours of the claim. Players who go unclaimed can be traded anywhere the rest of the season. Trade waivers are revocable. If a player is claimed, his team can pull him back and keep him. Why place Andujar, Bird, and Hicks on trade waivers? Well, why not? There’s no risk — again, if a player is claimed, his team can pull him back — and it allows the Yankees to gauge interest in their players. Also, teams flood the market with players to “hide” the guys they want to/are willing to trade. A claim limits the market. Teams want their players to clear to give them more potential trade options. Being placed on trade waivers last Thursday means the waiver period has already expired for Andujar, Bird, and Hicks. They’ve either cleared or been claimed and pulled back at this point. The 48-hour window to work out a trade would have expired already (I think). Even if the Yankees have soured on Bird and are open to moving him, doing it in August would be tough. That’s a move that was always going to wait until the offseason. The deadline to acquire players and have them be postseason eligible is 11:59pm ET on August 31st and that is a hard deadline with no loopholes. Four days remain to swing a deal for a postseason-eligible player. Andujar, Bird, and Hicks have already gone through the trade waiver process. Surely other Yankees have as well. Now it’s just a question of whether the Yankees swing a deal to address their outfield (and first base) need.